Are you running your business from the kitchen table at home, or trying to get some work done and sick of being constantly interrupted by the family popping in and out of the study? Perhaps you’re spending too much on coffee at the local café while you’re seated there from 9 to 5? Enter, co-working spaces. You may have heard the term “coworking” floating around (it’s one of the latest things in biz) but what actually is it? It may just sound like a space where you go to work in a room full of strangers, but it’s about meeting like-minded people and working alongside those who may have similar work challenges to yourself. The use of these spaces is common for freelancers, small business owners and corporates as it allows them to work alongside each other and share infrastructure and knowledge. Coworking spaces are office locations that are shared by multiple people from different organisations and are known for inspiring innovation and providing a space where new business models can come to life and perhaps even be seen by potential investors! Digital and mobile technology has given us the ability to work from anywhere. Likewise, social media and mobiles mean that we can collaborate with team members in different locations and time zones. New technologies are also helping to reduce the costs of running a business thanks to DIY website platforms, social media pages, digital marketplaces and online services including banking, document sharing platforms and email. Freelancers are on the rise with Australia having just over one million independent contractors in August 2015 – in fact, it’s estimated that one third of the Aussie workforce performs some form of freelance work. In 2005, a group of individuals from various creative industries came together to experiment working alongside each other in an open and shared space called Spiral Muse in San Francisco. Today, it’s become a global phenomenon known as co-working. Seeing as there were only 75 spaces worldwide in 2007, the trend has grown quite a bit! The number of spaces now exceeds 10,000 in over 140 countries. In fact, in 2013 there were only 60 co-working spaces in Australia. 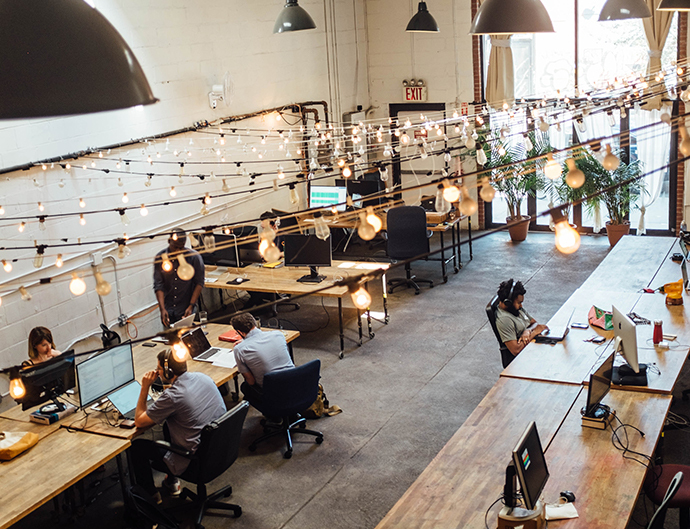 The popularity of co-working spaces is on the rise with the number of locations growing by 297% between 2013 and 2017 with a 62% growth across the nation in the last year alone! Getting up and going into the office each day provides human interaction, team building and community projects whereby you can share ideas and help one another learn. This is where coworking spaces come in. They provide co-creation, brainstorming, and idea sharing while also allowing the flexibility to work anywhere at any time. The key difference between an office and a co-working space is its focus around building a community. These spaces are open-plan workspaces that feature shared desks designed for people to work alongside one another. Coworking spaces are seen as the place between the office and home. Think along the lines of the group planning areas and activity planning sessions you would have with the team in the office. Coworking areas also include meeting rooms and open spaces or private rooms, presentation areas and facilities, kitchens and breakout areas to relax and a small amount of private offices. There’s usually even printing, email, WiFi, and telephone facilities. Some facilities expand the coworking community by engaging members in a range of social, networking and learning events, and introductions between individual members by the staff. Working alongside others provides a fantastic place to meet new people, build up your business connections, and expand your knowledge. This core idea is also represented in the names the owners choose for their spaces. You’ll usually see words such as “Centre”, “Hub”, “Cluster”, “Space” or “Hive” appear in the locations names to signify the group and collective essence behind the idea. Coworking spaces are usually run on a membership basis and utilise online booking systems in the form of apps or social sites. There are usually options for hot desking as well as permanent or long term rentals. If you visit the website Rushfaster, you’ll find an article listing some key co-working spaces throughout Australia. Where can I find these spaces? There are a number of spaces popping up all over Australia! Check out coworker.com or Rushfaster database database (updated weekly) or simply Google ‘coworking spaces near me’ to find your nearest location. Do you use co-working locations? Comment below and share your experience with us. Great concept I would expect. You haven’t used their correct name which is business incubators. In fact I used to manage 2 incubator sites – one was a technology business incubator which had high capacity digital fibre to the building which all tenants could access at a cost. The model was ahead of its time! This was around 4 years ago – way ahead of the digital transformation that has taken place in recent times.